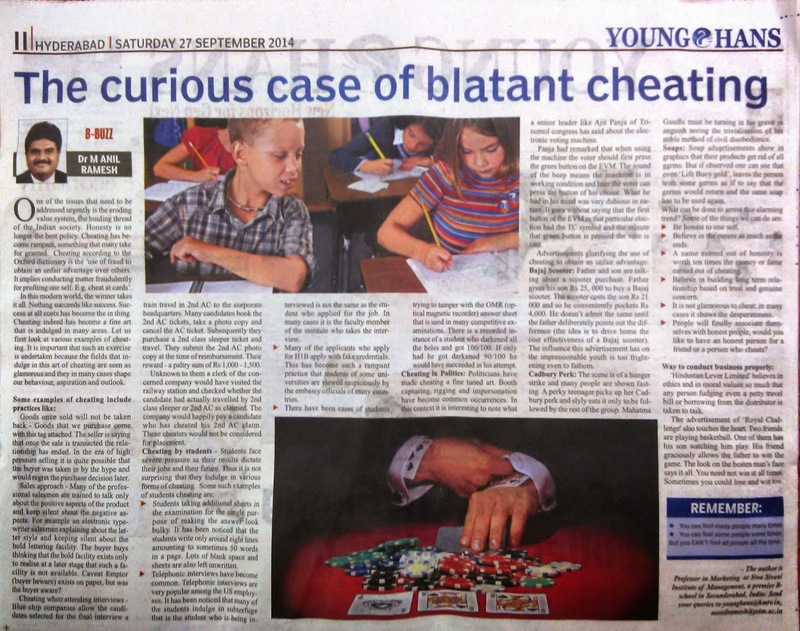 Dr.Anil - Marketing Musings: 16th Article published in HANS INDIA (27th September 2014) titled "The curious case of blatant cheating"
16th Article published in HANS INDIA (27th September 2014) titled "The curious case of blatant cheating"
16th Article published in HANS INDIA (27th September 2014). The article is titled "the curious case of blatant cheating". This article is very close to my heart. It was in making for the last 17 years. Lot of thinking, research, writing and rewriting has gone in. Read it and give me your feedback. One of the issues that need to be addressed urgently is the eroding value system, the binding thread of the Indian society. Honesty is no longer the best policy. Cheating has become rampant, something that many take for granted. Cheating according to the Oxford dictionary is the ‘use of fraud to obtain an unfair advantage over others. It implies conducting matter fraudulently for profiting one self. E.g. cheat at cards’. In this modern world, the winner takes it all. Nothing succeeds like success. Success at all costs has become the in thing. Cheating indeed has become a fine art that is indulged in many areas. Let us first look at various examples of cheating. It is important that such an exercise is undertaken because the fields that indulge in this art of cheating are seen as glamorous and they in many cases shape our behaviour, aspiration and outlook. Goods once sold will not be taken back - Goods that we purchase come with this tag attached. The seller is saying that once the sale is transacted the relationship has ended. In the era of high pressure selling it is quite possible that the buyer was taken in by the hype and would regret the purchase decision later. Sales approach - Many of the professional salesmen are trained to talk only about the positive aspects of the product and keep silent about the negative aspects. For example an electronic typewriter salesman explaining about the letter style and keeping silent about the bold lettering facility. The buyer buys thinking that the bold facility exists only to realise at a later stage that such a facility is not available. Caveat Emptor (buyer beware) exists on paper, but was the buyer aware? Cheating when attending interviews - Blue chip companies allow the candidates selected for the final interview a train travel in 2nd AC to the corporate headquarters. Many candidates book the 2nd AC tickets, take a photo copy and cancel the AC ticket. Subsequently they purchase a 2nd class sleeper ticket and travel. They submit the 2nd AC photo copy at the time of reimbursement. Their reward - a paltry sum of Rs 1,000 - 1,500. Unknown to them a clerk of the concerned company would have visited the railway station and checked whether the candidate had actually travelled by 2nd class sleeper or 2nd AC as claimed. The company would happily pay a candidate who has cheated his 2nd AC claim. These cheaters would not be considered for placement. Students taking additional sheets in the examination for the single purpose of making the answer look bulky. It has been noticed that the students write only around eight lines amounting to sometimes 50 words in a page. Lots of blank space and sheets are also left unwritten. Telephonic interviews have become common. Telephonic interviews are very popular among the US employees. It has been noticed that many of the students indulge in subterfuge that is the student who is being interviewed is not the same as the student who applied for the job. In many cases it is the faculty member of the institute who takes the interview. Many of the applicants who apply for H1B apply with fake credentials. This has become such a rampant practice that students of some universities are viewed suspiciously by the embassy officials of many countries. There have been cases of students trying to tamper with the OMR (optical magnetic recorder) answer sheet that is used in many competitive examinations. There is a recorded instance of a student who darkened all the holes and got 100/100. If only had he got darkened 90/100 he would have succeeded in his attempt. Cheating in Politics: Politicians have made cheating a fine tuned art. Booth capturing, rigging and impersonation have become common occurrences. In this context it is interesting to note what a senior leader like Ajit Panja of Trinomol congress has said about the electronic voting machine. Panja had remarked that when using the machine the voter should first press the green button on the EVM. The sound of the beep means the machine is in working condition and later the voter can press the button of his choice. What he had in his mind was very dubious in nature. It goes without saying that the first button of the EVM in that particular election had the TC symbol and the minute that green button is pressed the vote is cast. Bajaj Scooter: Father and son are talking about a scooter purchase. Father gives his son Rs 25, 000 to buy a Bajaj scooter. The scooter costs the son Rs 21 000 and so he conveniently pockets Rs 4,000. He doesn’t admit the same until the father deliberately points out the difference (the idea is to drive home the cost effectiveness of a Bajaj scooter). The influence this advertisement has on the impressionable youth is too frightening even to fathom. Cadbury Perk: The scene is of a hunger strike and many people are shown fasting. A perky teenager picks up her Cadbury perk and slyly eats it only to be followed by the rest of the group. Mahatma Gandhi must be turning in his grave in anguish seeing the trivialisation of his noble method of civil disobedience. Soaps: Soap advertisements show in graphics that their products get rid of all germs. But if observed one can see that even ‘Life Buoy gold’, leaves the person with some germs as if to say that the germs would return and the same soap has to be used again. Be honest to one self. Believe in the means as much as the ends. A name earned out of honesty is worth ten times the money or fame earned out of cheating. Believe in building long term relationship based on trust and genuine concern. It is not glamorous to cheat; in many cases it shows the desperateness. People will finally associate themselves with honest people, would you like to have an honest person for a friend or a person who cheats? ‘Hindustan Lever Limited’ believes in ethics and in moral values so much that any person fudging even a petty travel bill or borrowing from the distributor is taken to task. The advertisement of ‘Royal Challenge' also touches the heart. Two friends are playing basketball. One of them has his son watching him play. His friend graciously allows the father to win the game. The look on the beaten man’s face says it all. You need not win at all times. Sometimes you could lose and win too.